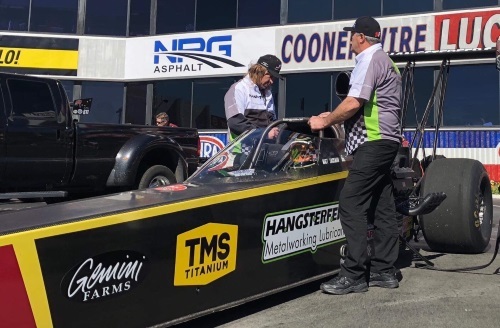 POMONA, Calif. (February 12, 2019) – Hangsterfer’s Metalworking Lubricants drivers Matt and Zach Sackman both raced to the final round in their respective classes at the season-opening Lucas Oil NHRA Winternationals Feb. 11 at Auto Club Raceway in Pomona, Calif.
Brothers Matt and Zach Sackman share the driving duties of the Hangsterfer’s Metalworking Lubricants Top Dragster owned by their parents, Darren and Marie. 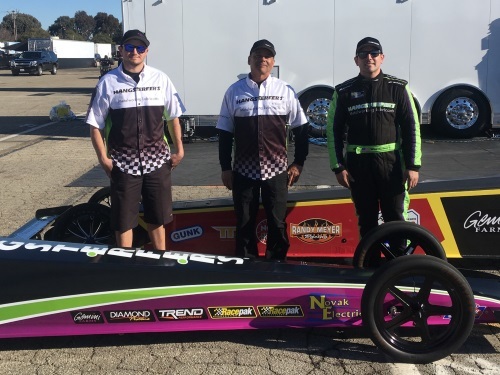 Matt Sackman, 25, is the cylinder head specialist on Don Schumacher Racing’s Matco Tools Top Fuel dragster driven by Antron Brown. Zach Sackman, 23, is a fabricator and chassis builder at Brandospeed in Fairfax, Iowa. 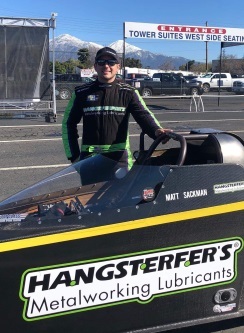 The Sackman Boyz Racing team receives support from Hangsterfer’s Metalworking Lubricants, Novak Electric, Diamond Pistons, Trend Performance, Lucas Oil, NGK Spark Plugs, T&E Auto Haulers, Gemini Farms, Brown & Miller Racing Solutions, Rolla Competition Engines, Harmonic Designs Inc., and TMS Titanium. 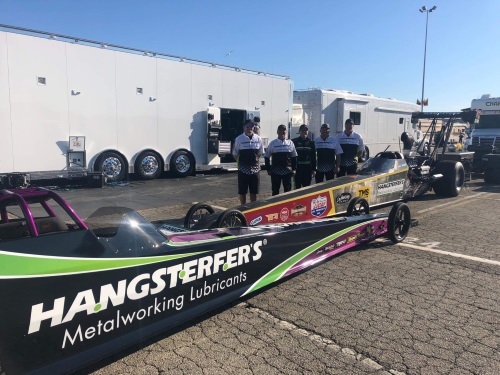 Hangsterfer’s Laboratories, Inc. specializes in the research, development and manufacture of a full line of REACH-compliant metalworking lubricants. This includes emulsifiable oils, semi-synthetics, synthetics, straight cutting oils, drawing and forming compounds, EDM fluid and machine lubricants. Improve your surface quality and tool life when machining, grinding and forming aluminum, chrome, nickel, Stainless Steel, titanium and their alloys. All products are produced in an ISO 9001-approved facility. For more information about Hangsterfer’s Laboratories, please visit www.hangsterfers.com.